Patriot Day is an annual observance on September 11 to remember those who were injured or died during the terrorist attacks in the United States on September 11, 2001. 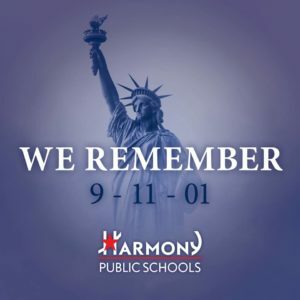 Harmony School of Endeavor will always remember everyone we lost on 9/11, thank the first responders who keep us safe, and honor all who defend our country and the ideals that bind us together. There’s nothing our resilience and resolve can’t overcome, and no act of terror can ever change who we are.